Tonight at 6 pm Milwaukee time, Marquette takes on Stan Heath and the South Florida Bulls (7-14, 2-7). This is Marquette's second game of a three game road trip. Their opponent, South Florida, is coming off a 65-48 loss at St. John's. This is Marquette's first trip back to South Florida since Jerel McNeal stole the ball to win the game 70-68. In fact, Rosiak's blog entry leads with McNeal's recollection of that game, which he calls "right up there with some of the best (victories)". However, as McNeal also highlights, that was one of those road games that MU seemed destined to choke away before McNeal's late game heroics. 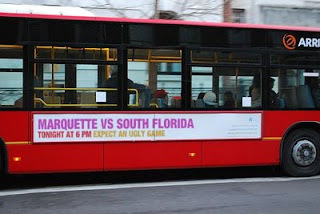 In addition, if you recall, last year's game with South Florida was a similarly scrappy game that Marquette won ugly. Finally, although USF's only two wins are against DePaul, the team managed to play Syracuse, Louisville, and Villanova all close at home. Add it all up, and as the bus advertisement says, expect an ugly game. The key contributor on the Bulls is 6'4 sophomore Dominique Jones, who averages 18.3 points per game. South Florida also gets contributions from 6'10 freshman Augustus Gloop, er Gilchrist (10.5 pts, 4.8 rebounds), and 6'4 senior Jesus Verdejo (13.6 ppg). In other news, USF used to get contributions from 6'4 junior Mike Mercer, but he was recently dismissed from the team. Game time is 6 pm Milwaukee time. Check here for your local TV clearances. Moving on to South Florida's strengths and weaknesses. 3. Keeping the pace slow – USF has the #304 slowest pace in the country (63.2 possessions per game). That is molasses slow. 4. Don’t commit turnovers (turnover rate at 15% or less), which is less than average. If MU gets sloppy against an opponent that doesn't force many turnovers, the game will get a lot tighter. Although Pomeroy predicts an 80% chance of victory, we are slightly less bullish with a percentage of 71%. We predict a very slow game (64 possessions) and a five point Marquette victory. Expect Marquette to lose on eFG% and OR%, but win based on advantages at turnover rate and FTR. Offense and defense are predicted to be worse than average. This will be one tough, ugly, slow game. Here's the GoMarquette.com official release, including their always enjoyable game notes. A very discouraging loss. We won the turnover battle by a little, won the offensive rebound battle (10 to 5) and won the battle to get to the line, 23 shots to 11. Obviously it was just a disasterous night shooting. Obviously Dominic missing 8 straight threes after his first one went in was bad, but the bigger problem was the 1 assist and 3 turnovers night after being on a 40-7 streak. A couple of those were times it looked like our players just weren't looking, and the other was actually off a great rebound where his foot landed on the line - but putting up the early 3 instead of getting the passes inside was a concern.